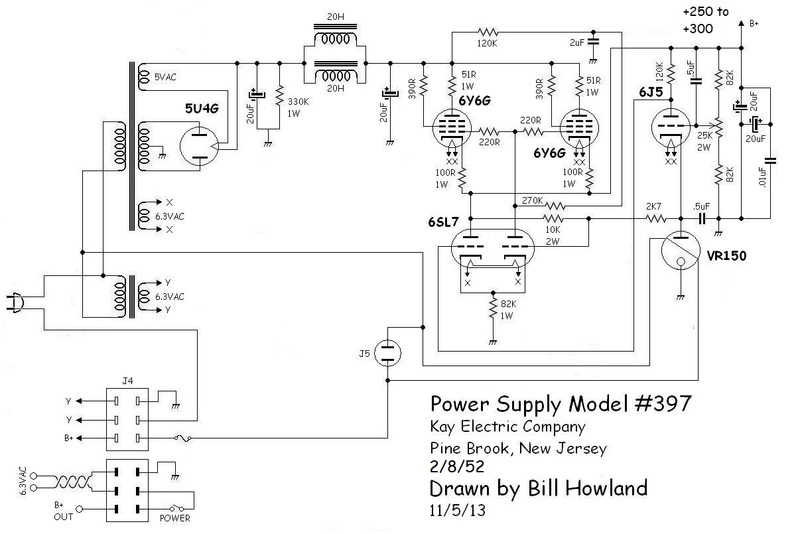 Here is the schematic of the Kay Electric Company power supply. 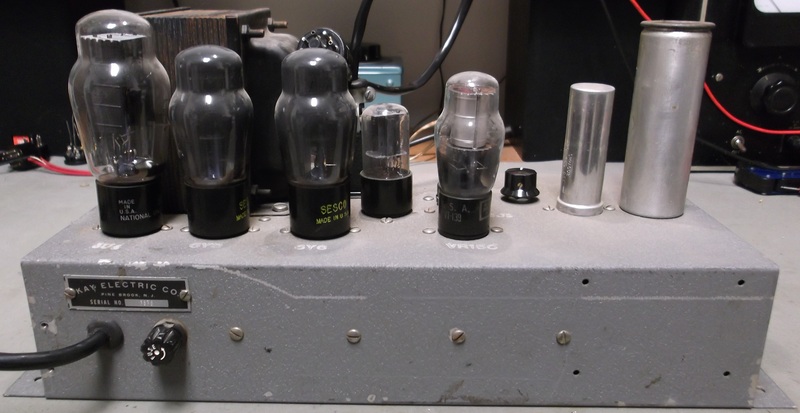 This circuit is typical of vacuum tube era regulated power supplies, with 6Y6 pass tubes, a 6SL7 “long-tail-pair” or current mirror voltage amplifier, 6J5 error amplifier, and VR150 150-volt reference tube. Note how this circuit is supplied by a floating 6.3VAC filament supply, while a separate transformer supplies 6.3VAC to the off-chassis circuitry. This second supply could be biased to eliminate hum in that circuit without exceeding heater-cathode voltage limits in this circuit. The output is adjustable via the potentiometer next to the 6J5, and with the components shown, the range of +250 to +300 is accurate. Changing the 82K resistors in series with that potentiometer would increase and/or alter the adjustment range. This power supply might be useful as a bench test instrument for trying amplifier circuit ideas, or to allow construction of finished items without each having an included power supply. What it does not include as-is is any sort of negative bias supply, although one could be added very easily.